"You can't win anything with kids," was a famous phrase used on BBC's Match of the Day by Alan Hansen to describe a youth filled Manchester United side's stumbling start to the 1995-1996 season. The notion that it was a great folly to trust in youth came back to bite the former Liverpool defender when the club would go on to win a domestic double that season. This wasn't the first time that United had put faith in a group of youngsters to take on the rigorous challenges of English football's top flight. Bringing young, often local, players into the first team squad at a tender age is a United tradition that started under the tenureship of former manager Sir Matt Busby in the 1950's. At a time when club's relied almost exclusively on experience, Busby dismissed concerns about his youthful side with an average age of 21 by famously saying, "If they're good enough, they're old enough." 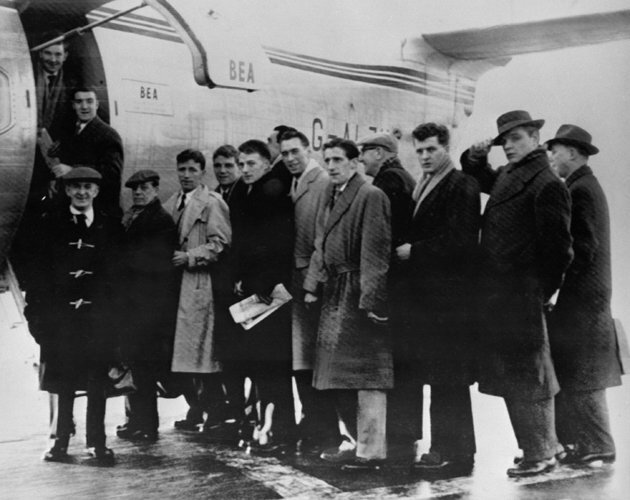 This first side of fresh faced youngsters, christened by the press as "The Busby Babes", did not disappoint as they stormed to league titles in 1955-1956 and 1956-1957, while just missing out on a league and cup double in that latter season after finishing as runners-up in the FA Cup Final. Playing a joyous form of free spirited attacking football, Busby's young squad featured exciting young players like Liam Whelan, Eddie Coleman, Tommy Taylor, Bobby Charlton and, their greatest star of all, Duncan Edwards. Hailing from Dudley in the Black Country, Edwards always stood head and shoulders above his contemporaries. With a solid build, a deft touch and a footballing brain that belied his years he always appeared to be a man among boys. 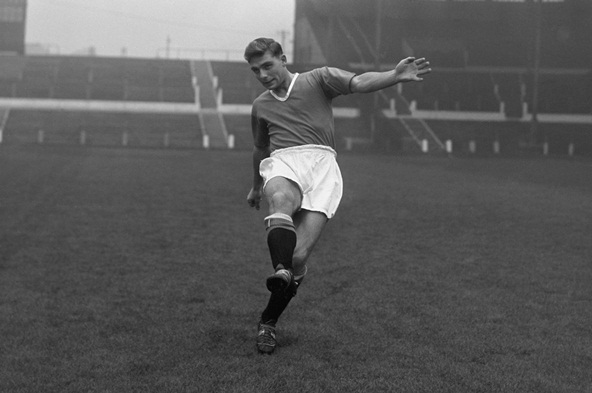 Debuting for United at 16, the only player Sir Bobby Charlton says he ever felt inferior to, Edwards earned his first cap for England at age 18. "Off the field he was a shy, modest guy, a gentle giant with a strong Midlands accent. But on the field he could do anything. He was a powerhouse and wanted the ball all the time. He stood out like a beacon." 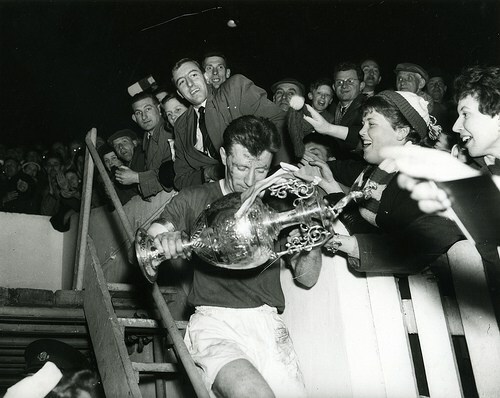 Besides their league success, United also became English football's pioneers in Europe as they stormed to the European Cup semi-final in 1957. A narrow loss over two legs to the great Real Madrid side of Alfredo Di Stéfano was disappointing, but appeared at the time as only a preview of an epic rivalry that would surely grip European football over the next few years. 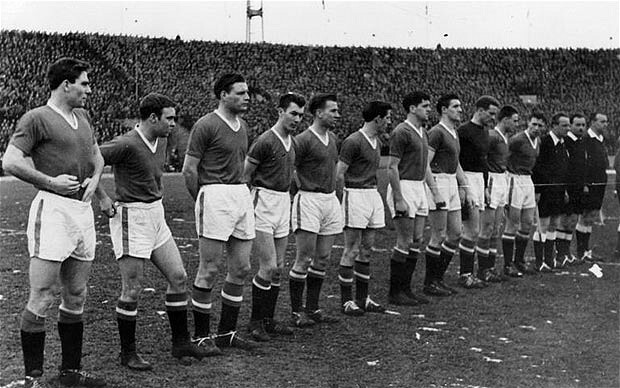 It was the pursuit of the European Cup that took United to Yugoslavia on 5 February 1958 for the second leg of a Quarter-Final tie with Red Star Belgrade. Having won the first leg 2-1 at Old Trafford, a 3-3 draw in Belgrade with two goals from Charlton and a goal from Dennis Voillet saw the Babes through 5-4 on aggregate. At the Majestic Hotel following the match, Red Star hosted a banquet for United and spirits were high as captain Roger Byrne led the players in a rendition of Vera Lynn's "We'll Meet Again." The next day following a refuelling stop in Munich, West Germany the Airspeed Ambassador 2 carrying the squad back to England crashed on takeoff resulting in 23 of the 44 passengers losing their lives. The heart of Busby's brilliant young side may have perished in the snow at Munich, but the memory of this squad and what they stood for is ingrained in the spirit of Manchester United and they will never be forgotten.